[Greenville, SC]- Artisphere, presented by TD Bank, announced some of the new and exciting programs for Greenville’s premier arts and cultural celebration, May 11-13, and reminded loyal patrons that many festival favorites will return in 2018. GE Artist Row will feature 135 visual artists, selected by a panel of five jurors from a record-breaking applicant pool of 1,163 (1 in 9 chance of acceptance). Thirty-five of the 135 will exhibit at Artisphere for the first time, and 15 are local Greenvillians, including: Kent Ambler (Printmaking), Kiah Bellows (Mixed Media-2D), Hallie Bertling (Painting-Watercolor), Joseph Bradley (Mixed Media-2D), Rey D’Alfonso (Painting-Oil/Acrylic; Mixed Media-2D), Patricia DeLeon Alfonso (Painting-Oil/Acrylic), Janina Ellis (Painting-Oil/Acrylic), Darin Gehrke (Ceramics), Keith Grace (Mixed Media-2D), Lynn Greer (Painting-Watercolor), Michelle Jardines (Painting-Oil/Acrylic), Meredith Piper (Mixed Media-2D), Llyn Strong (Jewelry/Precious), Erin Stuart (Jewelry/Semi-Precious), and Judy Verhoeven (Mixed Media-2D). From the creative city of Chicago, IL, Nate Baranowski will join the lineup of working artists at Artisphere 2018. He is a street painter, muralist, and fine artist who travels to create three-dimensional chalk drawings at festivals worldwide. View Nate’s creation from the Main Street Bridge, then walk through his 3D visual experience along River Walk. For more information, visit www.natebaranowski.com. DRUM Percussion Studio and the Logos Theatre will lead children through musical instrument and theatre costume exploration in the newly added Kidsphere South, a second hands-on interactive area anchoring the south end of the festival. Children will have an opportunity to create sound shakers, participate in music making, and interact with larger-than-life costumed characters. DRUM Percussion Studio and the Logos Theatre will also parade down Main Street throughout the weekend with The Chronicles of Narnia puppets, stilt walkers, percussionists, and more. Since its introduction to festival programming in 2013, the Art Lab has quickly become a festival “must do” as it provides DIYers an opportunity to flex their creative muscles under the instruction of local experts. This year’s programming lineup offers 13 different workshops, including painting with Vino & van Gogh and a creative writing exercise with the EMRYS Foundation. 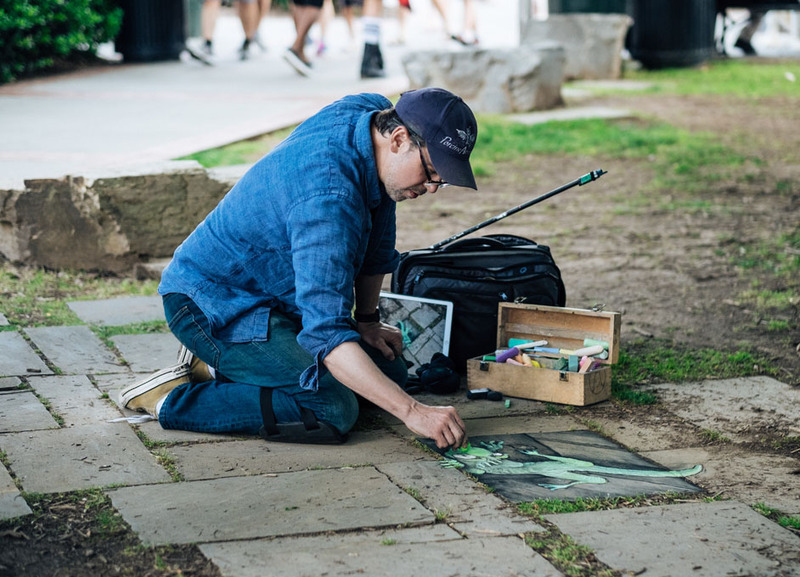 David Zinn, illustrator and street artist, created his own version of “Mice on Main” (originally created by Jim Ryan, Zan Wells, and Linda Kelly) at the 2017 festival and will be returning to the 2018 festival with more whimsical chalk creations. Using chalk and charcoal, Zinn integrates his temporary pieces into the local landscape. From Ann Arbor, MI (Zinn’s creative space) to Manhattan to Sweden, his loveable creatures have been featured in multiple cities worldwide. 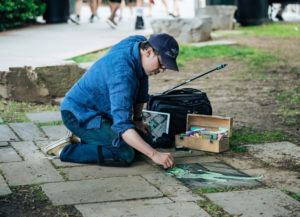 David Zinn at work during Artisphere 2017. Photo by Will Crooks. Returning to Artisphere 2018 are the Clemson University Science, Technology, Engineering, Arts, & Mathematics (STEAM) Exhibit (featuring over a dozen interactive activities), the Current Tools Greenville County High School Exhibit (showcasing over 175 student artists), The Greenville Journal and Greenville Health System Artists of the Upstate Juried Exhibition (spotlighting over 60 local artists) and the University of South Carolina Art of Healthy Living Exhibit (promoting health sciences via interactive experiences). These special exhibits give patrons a glimpse of artists at every stage of their career, from student to professional, and offer opportunities to explore art as it intersects with modern day technology, health and life. Kidsphere on the north end of the festival (the intersection of Broad & Main Streets) has been an Artisphere staple since the festival’s inception, welcoming thousands of children every year to participate in hands-on visual arts and crafts. This year’s activities will include Handmade Hats, Mother’s Day Cards, Fabric Mosaics, and a Young Painter’s Station. Students from the South Carolina Governor’s School for the Arts and Humanities, along with staff and artists from the Greenville Center for Creative Arts, will lead children in making crafts and developing creativity in this area. Also returning is the ever-popular Metromont Community Sculpture located in Falls Park, offering an opportunity for any Artisphere visitor to add to a collaborative artistic installation. The Greenville County School District Career Centers’ Culinary Program (Artisphere Culinary Arts Café 2017 Best in Show Winner) returns to the festival, along with some of Greenville’s favorite restaurants, including Larkin’s on the River, Barley’s Taproom, The Trappe Door, and more. Whether you crave pizza, tacos, or shrimp and grits, you’ll find your happy medium at the Culinary Arts Café. Cross over Main Street, and you can wash it all down with a trip through the SunTrust Bank Wine & Craft Beer Experience, where you can sample dozens of local and regional wines and craft beers. Back for the 14th year in a row, Brian Olsen’s Art in Action returns to the Wells Fargo Stage in Falls Park. 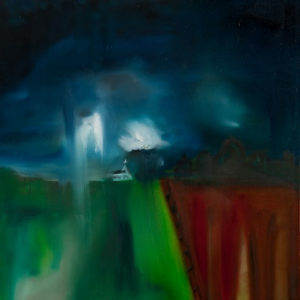 Olsen’s performances are an explosion: a colorful display of paint, energy, music, and passion. 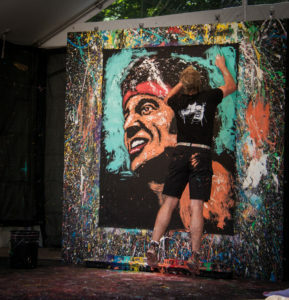 Using fingertips, palms, elbows and up to three brushes in each hand, Olsen paints portraits of famous musicians, sports figures, and pop culture icons on a 4.5’ x 6’ canvas in a matter of minutes. He takes the audience through an amazing journey of excitement, suspense, cheer, and surprise. Brian Olsen at Artisphere 2017. Photo by Polly Gaillard. This year’s music line-up hosts talented musicians from the Catskill Mountains, NY and Kalamazoo MI, to North Hampton, MA, and Nashville, TN and offers something for everyone from R&B to Jazz, Indie to Americana and Funk to Reggae. Headlining acts include Sister Sparrow, a Rock/Blues/Soul/Funk group from the Catskill Mountains, NY, and Mandolin Orange, a Folk/Bluegrass group from Chapel Hill, NC. Artisphere will also present regional favorites Phat Lip (Greenville, SC), Beta Radio (Wilmington, NC), The Get Right Band (Asheville, NC) and The Harmaleighs (Nashville, TN) among others. Check out the full music line-up on www.artisphere.org/performing-arts. Find your happy medium at Artisphere, presented by TD Bank, May 11-13, 2018.